When professional basketball player, Rashad Vaughn, and his cousin, Chris Davis, wanted to see a different kind of change in their community, they knew just how to start it. Chris Davis has always been passionate about giving back to his community. That’s why when his cousin and professional basketball player, Rashad Vaughn, who previously played for the Milwaukee Bucks, contemplated using his recently earned salary to start a foundation, both men agreed that Davis was the perfect person to stand at its helm. Within a couple of days, the Rashad Vaughn Foundation, or RVF, was created. The organization is arranged with Davis as its CEO, Vaughn as its president, and both men’s brothers, Nick and Troy, respectively, coordinating day-to-day activities of its core youth program, Only Us. The Rashad Vaughn Foundation’s mission is to positively impact youth through education, athleticism and leadership development. Through academic scholarships, food drives, gift donations and a strong belief in youth engagement and empowerment, the RVF’s long-term plan is become and stay a staple on the northside. Growing up in North Minneapolis, the four men, once adolescent boys, found a lack of black male leadership within their community so they created RVF to fill a void they believed they had been missing as kids to the next generation. Davis, who has worked with other Minneapolis non-profits like Hospitality House and the Boys and Girls Club, hopes to spend more time building and restructuring the RVF’s primary youth program, Only Us, which centers around cultivating mentorship and leadership skills among high-achieving black youth participants within north Minneapolis. Davis believes that due to him and the program’s twelve male mentees being close in age, he and his co-organizers can structure the program’s curriculum to better understand and address their experiences and the type of development they will need. In trying to connect with the northside neighborhood, RVF has spent the last few months visiting families, sponsoring holiday dinners, hosting back-to-school supply drives and personally delivering food packages to those in need. 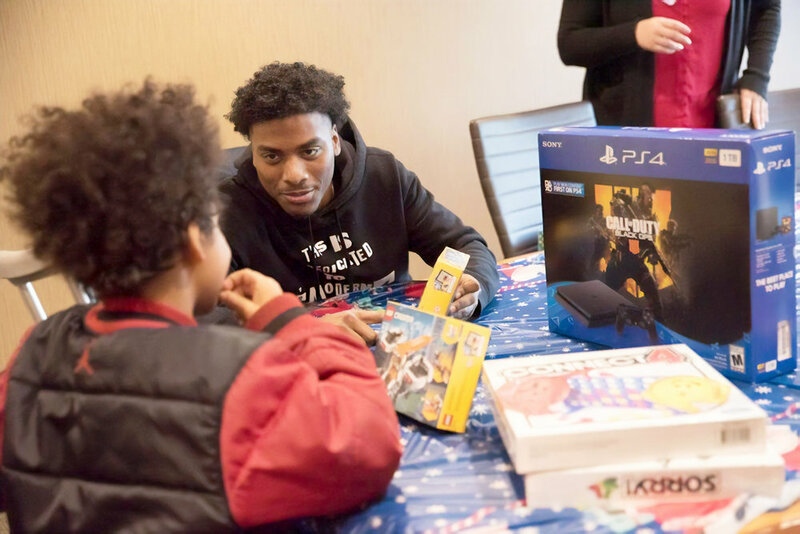 Just this past holiday season, Davis and Vaughn visited the hospital bed of a nine-year-old, who was recently hit by a car and broke his leg. Though the boy will now be on crutches for a few weeks, his mounting hospital bills created a financial burden on his family as they prepared to buy Christmas presents for him and his five other siblings. When Davis and Vaughn heard of the family’s plight, they knew right away they had to do something. They contacted North Memorial Hospital and organized a gift drive to help alleviate some of financial stress the holiday season can bring. Davis knows that building the RVF depends on the very participants they aim to serve. He believes that as young men, his mentees will need help forging their academic and career paths as they try to overcome systematic obstacles. However, he maintains that he will be there for them every step of the way and he will always provide the one thing he knows black students in Minneapolis may have difficulty finding.